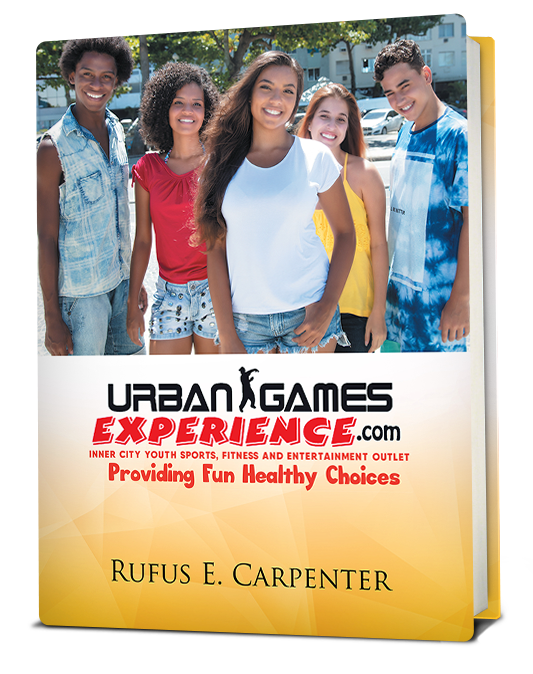 New Book Release - "Urban Games Experience.Com"
This self-help book entitled "Urban Games Experience.Com: Inner City Youth Sports, Fitness and Entertainment Outlet" by Rufus Carpenter. Provides the information needed to set up a managed year-round sports and recreational program created for urban America called, "The Urban Games." The book walks you through the process of creating a fun local group-paced program that proves participants with an opportunity to grow, learn, and excel in a social environment. The program outlined in the book is divided into four thirteen-week periods that incorporates amusement, curiosity, and creativity as well as confidence building, entertainment, and exercise for the body. The book was written to encourage the reader, especially the volunteer, event sponsor, subscriber, advertiser, and service provider partners to get involued in this inspirational youth and community development project. Save money and time, get your copy here at our on-line community sale price for only $45.95, right now! Urban Games Experience, LLC a company of creators, educators, performers, entrepreneurs and subscribers who are imagining and developing the curriculum that's focused on surrounding young people with activities and experiences designed to let them touch what they could only dream of before. Through great programs, sounds, beats, and stories about the black culture, black community and its youth, as fun, fitness and a good time with family and friends. We are continuing a self-help initiative that dates back to America’s civil right movement. 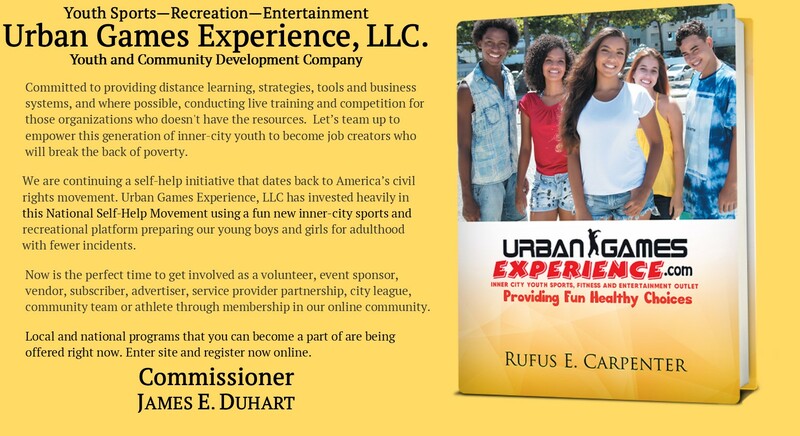 Urban Games Experience, LLC has invested heavily in this national self-help movement using a fun new inner-city sports and recreational platform preparing our young boys and girls for adulthood with fewer incidents. Urban Games Experience, a trusted 25 year training foundation - we were passionate about developing a program to challenge the intellect and divert the energy of an at-risk youth group who were too familiar with violence in their environment, particularly amongst their peers. This concept was created to keep inner-city youth occupied with constructive activities, to foster physical fitness and equip volunteers and others seeking the resources needed to teach young people discipline, responsibility, tolerance, communication skills, and self-confidence. These are the characteristics needed by so many children for continuous growth and development in America’s inner city communities. Urban Games Experience very clearly is a call to action for you, your organization and all who have ever wanted to get involved in something positive and productive within their local area. Volunteers and sponsors are formally recognized throughout the program for their contribution in helping give youth a major head start on a stable career and a better quality-of-life. This truly is a program that lasts a lifetime, and where participation brings out the best in children and inner city families. It provides them with a healthy energy outlet that develops great character while delivering valuable business operations and entrepreneurial training experiences they are not getting anywhere else. An Inner-City Sports and Recreational Platform giving this generation of young Americans’ a high-performing community environment in which they will excel. In summary, Urban Games Experience. LLC is committed to providing distance learning, strategies, tools and business systems, and where possible, conducting live training and competition for those organizations who doesn't have the resources. Let’s team up to empower this generation of inner city youth to become job creators who will break the back of poverty. Now is the perfect time to get involved as a volunteer, event sponsor, subscriber, advertiser, service provider partnership, city league, or community team through membership in our online community. Local and national programs are being offered right now. Enter site and register now online.